Can utilities rebound before someone else takes over the relationship? 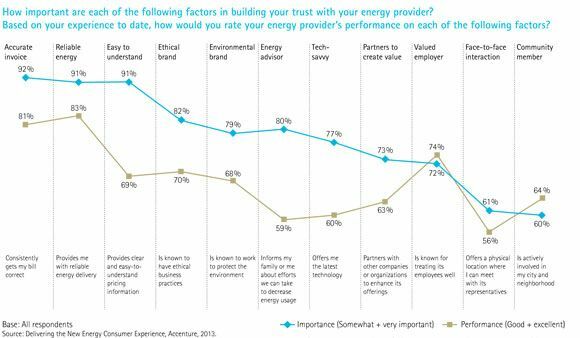 Two years ago, Greentech Media asked if utilities could rebuild trust with customers. According to a recent study by Accenture, it appears that it hasn't happened yet. Less than one-fourth of consumers trust their utility, 9 percent below last year and the lowest figure since Accenture began the annual survey four years ago. Globally, customer satisfaction also dropped 12 percentage points to 47 percent in the past year alone. The falling rates of satisfaction come at a time when people are increasingly reliant on consumer electronics and as long outages after major storms become more frequent in the U.S. Also, the digital revolution has changed the way most people interact with businesses, and many utilities have struggled to keep up. The result is that people are increasingly looking past the utility for energy-related services. Home services providers, security companies and commercial retailers are all taking a piece of what could be new revenue streams for utilities. 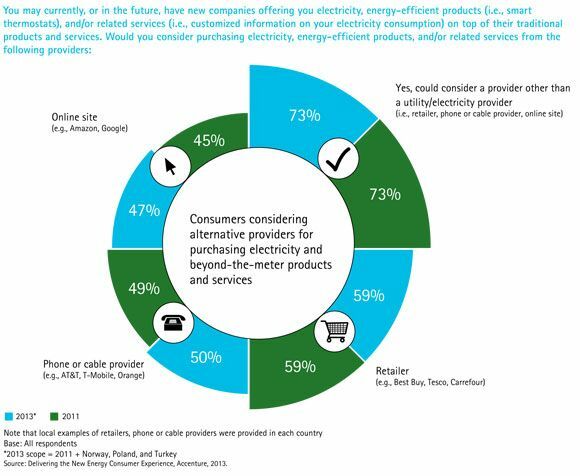 More than 70 percent of consumers surveyed by Accenture said they would consider a provider other than the utility for energy services if it were available. 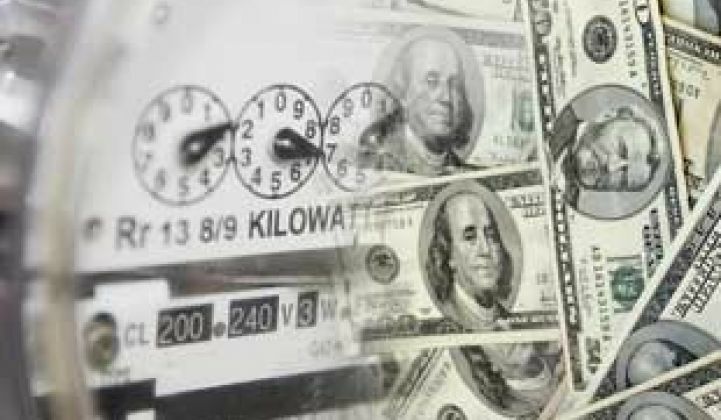 “Utilities need to consider radically rethinking their customer satisfaction investments with a targeted approach to simplifying the consumer energy experience, addressing the concerns of dissatisfied consumers and closing the expectation gap,” said Greg Guthridge, managing director for Accenture Energy Consumer Services, in a statement. Increasingly, consumer engagement cannot just be a panel topic at smart grid conferences, but instead must become a core undertaking for utilities. It is not just the utilities that need to radically rethink how they do business. Regulators must also allow utilities to become energy service providers to compete with other providers. If utilities are allowed to compete, it will have to come with customer experiences that are as good, if not better, than what they can get through other channels. “It’s becoming clear that utilities are at a turning point when it comes to serving the new, tech-savvy consumer,” Guthridge said. Customers want everything from detailed usage information (if they have a smart meter) to more rate-plan options and digital tools, such as email or text bill alerts. While some utilities are providing some of these services, the revolution is not happening fast enough for many consumers. In the next few years, utilities will not only have to build out those platforms while also maintaining and upgrading an aging electrical grid, but also do it all while providing a level of customer service many have never had to provide before. “Many utilities are at an inflection point at which they should redefine their role in consumers’ lives and refocus on building a base of trust,” said Guthridge. “The first step is making interactions simple, and in particular, getting the basics right the first time."